This book provides a comparative history of Islamic education in the Soviet Union and the post-Soviet countries. 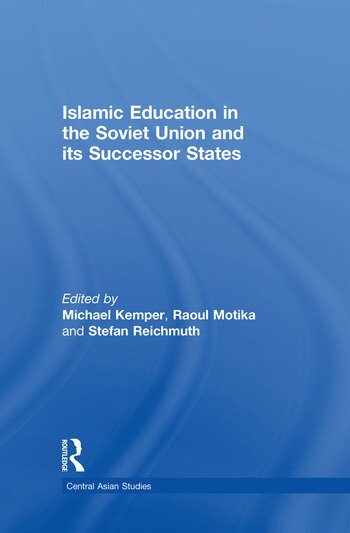 Case studies on Ukraine, Azerbaijan, Kazakhstan, Uzbekistan, and Tajikistan and on two regions of the Russian Federation, Tatarstan and Daghestan, highlight the importance which Muslim communities in all parts of the Soviet Union attached to their formal and informal institutions of Islamic instruction. New light is shed on the continuity of pre-revolutionary educational traditions – including Jadidist ethics and teaching methods – throughout the New Economic Policy period (1921-1928), on Muslim efforts to maintain their religious schools under Stalinist repression, and on the complete institutional breakdown of the Islamic educational sector by the late 1930s. A second focus of the book is on the remarkable boom of Islamic education in the post-Soviet republics after 1991. Contrary to general assumptions on the overwhelming influence of foreign missionary activities on this revival, this study stresses the primary role of the Soviet Islamic institutions which were developed during and after the Second World War, and of the persisting regional and even international networks of Islamic teachers and muftis. Throughout the book, special attention is paid to the specific regional traditions of Islamic learning and to the teachers’ affiliations with Islamic legal schools and Sufi brotherhoods. The book thus testifies to the astounding dynamics of Islamic education under rapidly changing and oftentimes extremely harsh political conditions. Introduction 1. Islamic Education in Soviet and Post-Soviet Tatarstan Dilyara Usmanova, Ilnur Minnullin and Rafik Mukhametshin 2. Islamic Education in Ukraine Alexander Bogomolov, Sergiy Danylov, Oleg Bubenok and Daniil Radivilov 3. Islamic Education in Soviet and Post-Soviet Daghestan Vladimir Bobrovnikov, Amir Navruzov and Shamil Shikhaliev 4. Islam and Islamic Education in Soviet and Independent Azerbaijan Altay Göyüsov and Elçin Äskärov 5. Islamic Education in Soviet and Post-Soviet Uzbekistan Ashirbek Muminov, Uygun Gafurov and Rinat Shigabdinov 6. Islamic Education in Soviet and Post-Soviet Kazakhstan Aitzhan Sh. Nurmanova and Asilbek K. Izbairov 7. Muslims without Learning, Clergy without Faith: Institutions of Islamic Learning in the Republic of Tajikistan Tim Epkenhans. Michael Kemper is Professor of Eastern European Studies and Eastern European History at the University of Amsterdam, The Netherlands. Raoul Motika is Professor of Turcology at the University of Hamburg, Germany. Stefan Reichmuth is Professor of Oriental and Islamic Studies at the Ruhr-University, Bochum, Germany.